Press Release:– According to the Scholarship Plan of Cuba approved for 2018, the Embassy of Cuba in Saint Lucia concluded the process of granting a total of thirteen (13) Scholarships to Saint Lucia in the specialties of Medicine, Dentistry and Post-Graduate Medical Scholarships. 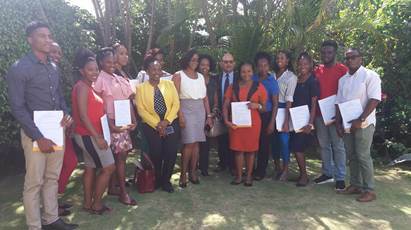 The selected Saint Lucian students signed the commitment to the Code of Ethics to be observed in the Cuban Higher Education Centers and received their Scholarship Files. In his speech, the Cuban Ambassador, Jorge Soberon, acknowledged the support of the Government of Saint Lucia in the completion of the process of granting the Scholarships. Cuba continues to strive to maintain the Scholarship Program. 560 Saint Lucians graduated in Higher Education Centers in Cuba from the beginning of the Program until 2017. Thank you Cuba for your continuation of scholarships.